Most recent papers can be downloaded below or at the links because they are open access. The remaining papers can be downloaded here, but that requires a password. Email me for the password or specific papers and I'll send them to you. Organism size and growth curves are important biological characteristics. Current methods to measure organism size, and in particular growth curves, are often resource intensive because they involve many manual steps. Here we demonstrate a method for automated, high-throughput measurements of size and growth in individual aquatic invertebrates kept in microtiter well-plates. We use a spheroid counter (Cell3iMager, cc-5000) to automatically measure size of seven different freshwater invertebrate species. Further, we generated calibration curves (linear regressions, all p < 0.0001, r2 >=0.9 for Ceriodaphnoa dubia, Asellus aquaticus, Daphnia magna, Daphnia pulex; r2 >=0.8 for Hyalella azteca, Chironomus spec. larvae and Culex spec. larvae) to convert size measured on the spheroid counter to traditional, microscope based, length measurements, which follow the longest orientation of the body. Finally, we demonstrate semi-automated measurement of growth curves of individual daphnids (C. dubia and D. magna) over time and find that the quality of individual growth curves varies, partly due to methodological reasons. Nevertheless, this novel method could be adopted to other species and represents a step change in experimental throughput for measuring organisms’ shape, size and growth curves. It is also a significant qualitative improvement by enabling high-throughput assessment of inter-individual variation of growth. Pesticides used in commercial crop systems can adversely affect non‐target arthropod populations. The spatial distribution of pesticide residues is rarely studied at scales relevant to these populations. Here, we combine two methods for assessing pesticide spray deposits at spatial scales relevant to non‐target arthropods found in apple orchards. Pesticide residues were determined on individual apple leaves through conventional residue analysis; water‐sensitive paper was used to investigate spatial distributions in deposits at the micro‐scale. We also evaluated how accurately a digital image analysis program estimated pesticide residues. We found that mean pesticide spray coverage on water‐sensitive paper varied by up to 6.1% (95% CI 9.4%, 2.7%) within an apple orchard, and leaf residues varied by up to 0.95 (95% CI 0.54, 1.36) mg kg−1 within a tree. Leaf residues based on analytical chemistry were six times lower than pesticide deposition estimated through image analysis of water‐sensitive paper, although these correlated strongly. This correlation allowed estimation of actual residues by application of a correction factor. Our method demonstrates accurate estimation of pesticide deposits at the individual leaf scale through digital analysis of water‐sensitive paper and is a low‐cost, rapid alternative to conventional residue analysis techniques. Chemical impacts on the environment are routinely assessed in single‐species tests. They are employed to measure direct effects on nontarget organisms, but indirect effects on ecological interactions can only be detected in multispecies tests. Micro‐ and mesocosms are more complex and environmentally realistic, yet they are less frequently used for environmental risk assessment because resource demand is high, whereas repeatability and statistical power are often low. Test systems fulfilling regulatory needs (i.e., standardization, repeatability, and replication) and the assessment of impacts on species interactions and indirect effects are lacking. In the present study we describe the development of the TriCosm, a repeatable aquatic multispecies test with 3 trophic levels and increased statistical power. High repeatability of community dynamics of 3 interacting aquatic populations (algae, Ceriodaphnia, and Hydra) was found with an average coefficient of variation of 19.5% and the ability to determine small effect sizes. The TriCosm combines benefits of both single‐species tests (fulfillment of regulatory requirements) and complex multispecies tests (ecological relevance) and can be used, for instance, at an intermediate tier in environmental risk assessment. Furthermore, comparatively quickly generated population and community toxicity data can be useful for the development and testing of mechanistic effect models. Environmental risk assessment (ERA) of chemicals relies on the combination of exposure and effects assessment. Exposure concentrations are commonly estimated using mechanistic fate models, but the effects side is restricted to descriptive statistical treatment of toxicity data. Mechanistic effect models are gaining interest in a regulatory context, which has also sparked discussions on model quality and good modeling practice. Proposals for good modeling practice of effect models currently focus very much on population and community models, whereas effects models also exist at the individual level, falling into the category of toxicokinetic–toxicodynamic (TKTD) models. In contrast to the higher‐level models, TKTD models are usually completely parameterized by fitting them to experimental data. In fact, one of their explicit aims is to replace descriptive methods for data analysis. Furthermore, the construction of these models does not fit into an orderly modeling cycle, given that most TKTD models have been under continuous development for decades and are being applied by many different research groups, for many different purposes. These aspects have considerable consequences for the application of frameworks for model evaluation. For example, classical sensitivity analysis becomes rather meaningless when all model parameters are fitted to a data set. We illustrate these issues with the General Unified Threshold model for Survival (GUTS), relate them to the quality issues for currently used models in ERA, and provide recommendations for the evaluation of TKTD models and their analyses. As ecotoxicologists we strive for a better understanding of how chemicals affect our environment. Humanity needs tools to identify those combinations of man-made chemicals and organisms most likely to cause problems. In other words: which of the millions of species are at risk from pollution? And which of the tens of thousands of chemicals contribute most to the risk? We identified our poor knowledge on physiological modes of action (how a chemical affects the energy allocation in an organism), and how they vary across species and toxicants, as a major knowledge gap. We also find that the key to predictive ecotoxicology is the systematic, rigorous characterization of physiological modes of action because that will enable more powerful in vitro to in vivo toxicity extrapolation and in silico ecotoxicology. In the near future, we expect a step change in our ability to study physiological modes of action by improved, and partially automated, experimental methods. Once we have populated the matrix of species and toxicants with sufficient physiological mode of action data we can look for patterns, and from those patterns infer general rules, theory and models. “The dose makes the poison”. This principle assumes that once a chemical is cleared out of the organism (toxicokinetic recovery), it no longer has any effect. However, it overlooks the other process of re-establishing homeostasis, toxicodynamic recovery, which can be fast or slow depending on the chemical. Therefore, when organisms are exposed to two toxicants in sequence, the toxicity can differ if their order is reversed. We test this hypothesis with the freshwater crustacean Gammarus pulex and four toxicants that act on different targets (diazinon, propiconazole, 4,6-dinitro-o-cresol, 4-nitrobenzyl chloride). We found clearly different toxicity when the exposure order of two toxicants was reversed, while maintaining the same dose. Slow toxicodynamic recovery caused carry-over toxicity in subsequent exposures, thereby resulting in a sequence effect–but only when toxicodynamic recovery was slow relative to the interval between exposures. This suggests that carry-over toxicity is a useful proxy for organism fitness and that risk assessment methods should be revised as they currently could underestimate risk. We provide the first evidence that carry-over toxicity occurs among chemicals acting on different targets and when exposure is several days apart. It is therefore not only the dose that makes the poison but also the exposure sequence. Current environmental risk assessments (ERA) do not account explicitly for ecological factors (e.g. species composition, temperature or food availability) and multiple stressors. Assessing mixtures of chemical and ecological stressors is needed as well as accounting for variability in environmental conditions and uncertainty of data and models. Here we propose a novel probabilistic ERA framework to overcome these limitations, which focusses on visualising assessment outcomes by construct-ing and interpreting prevalence plots as a quantitative prediction of risk. Key components include environmental scenarios that integrate exposure and ecology, and ecological modelling of relevant endpoints to assess the effect of a combination of stressors. Our illustrative results demonstrate the importance of regional differences in environmental conditions and the confounding interactions of stressors. Using this framework and prevalence plots provides a risk-based approach that combines risk assessment and risk management in a meaningful way and presents a truly mechanistic alternative to the threshold approach. Even whilst research continues to improve the underlying models and data, regulators and decision makers can already use the framework and prevalence plots. The integration of multiple stressors, environmental conditions and variability makes ERA more relevant and realistic. For the past 20 years, research on biodiversity and ecosystem functioning (B-EF) has only implicitly considered the underlying role of environmental change. We illustrate that explicitly reintroducing environmental change drivers in B-EF research is needed to predict the functioning of ecosystems facing changes in biodiversity. Next we show how this reintroduction improves experimental control over community composition and structure, which helps to provide mechanistic insight on how multiple aspects of biodiversity relate to function and how biodiversity and function relate in food webs. We also highlight challenges for the proposed reintroduction and suggest analyses and experiments to better understand how random biodiversity changes, as studied by classic approaches in B-EF research, contribute to the shifts in function that follow environmental change. Current regulatory practice for chemical risk assessment suffers from the lack of realism in conventional frameworks. Despite significant advances in exposure and ecological effect modeling, the implementation of novel approaches as high-tier options for prospective regulatory risk assessment remains limited, particularly among general chemicals such as down-the-drain ingredients. While reviewing the current state of the art in environmental exposure and ecological effect modeling, we propose a scenario-based framework that enables a better integration of exposure and effect assessments in a tiered approach. Global- to catchment-scale spatially explicit exposure models can be used to identify areas of higher exposure and to generate ecologically relevant exposure information for input into effect models. Numerous examples of mechanistic ecological effect models demonstrate that it is technically feasible to extrapolate from individual-level effects to effects at higher levels of biological organization and from laboratory to environmental conditions. However, the data required to parameterize effect models that can embrace the complexity of ecosystems are large and require a targeted approach. Experimental efforts should, therefore, focus on vulnerable species and/or traits and ecological conditions of relevance. We outline key research needs to address the challenges that currently hinder the practical application of advanced model-based approaches to risk assessment of down-the-drain chemicals. A model for the corn rootworm Diabrotica spp. combined with a temporally explicit model for development of corn roots across the soil profile was developed to link pest ecology, root damage and yield loss. Development of the model focused on simulating root damage from rootworm feeding in accordance with observations in the field to allow the virtual testing of efficacy from management interventions in the future. We present the model and demonstrate its applicability for simulating root damage by comparison between observed and simulated pest development and root damage (assessed according to the node injury scale from 0 to 3) for field studies from the literature conducted in Urbana, Illinois (US), between 1991 and 2014. The model simulated the first appearance of larvae and adults to within a week of that observed in 88 and 71 % of all years, respectively, and in all cases to within 2 weeks of the first sightings recorded for central Illinois. Furthermore, in 73 % of all years simulated root damage differed by <0.5 node injury scale points compared to the observations made in the field between 2005 and 2014 even though accurate information for initial pest pressure (i.e. number of eggs in the soil) was not measured at the sites or available from nearby locations. This is, to our knowledge, the first time that pest ecology, root damage and yield loss have been successfully interlinked to produce a virtual field. There are potential applications in investigating efficacy of different pest control measures and strategies. The General Unified Threshold model for Survival (GUTS) integrates previously published toxicokinetic-toxicodynamic models and estimates survival with explicitly defined assumptions. Importantly, GUTS accounts for time-variable exposure to the stressor. We performed three studies to test the ability of GUTS to predict survival of aquatic organisms across different pesticide exposure patterns, time scales and species. Firstly, using synthetic data, we identified experimental data requirements which allow for the estimation of all parameters of the GUTS proper model. Secondly, we assessed how well GUTS, calibrated with short-term survival data of Gammarus pulex exposed to four pesticides, can forecast effects of longer-term pulsed exposures. Thirdly, we tested the ability of GUTS to estimate 14-day median effect concentrations of malathion for a range of species and use these estimates to build species sensitivity distributions for different exposure patterns. We find that GUTS adequately predicts survival across exposure patterns that vary over time. When toxicity is assessed for time-variable concentrations species may differ in their responses depending on the exposure profile. This can result in different species sensitivity rankings and safe levels. The interplay of exposure pattern and species sensitivity deserves systematic investigation in order to better understand how organisms respond to stress, including humans. The General Unified Threshold model of Survival (GUTS) provides a consistent mathematical framework for survival analysis. However, the calibration of GUTS models is computationally challenging. We present a novel algorithm and its fast implementation in our R package, GUTS, that help to overcome these challenges. We show a step-by-step application example consisting of model calibration and uncertainty estimation as well as making probabilistic predictions and validating the model with new data. Using self-defined wrapper functions, we show how to produce informative text printouts and plots without effort, for the inexperienced as well as the advanced user. The complete ready-to-run script is available as supplemental material. We expect that our software facilitates novel re-analysis of existing survival data as well as asking new research questions in a wide range of sciences. In particular the ability to quickly quantify stressor thresholds in conjunction with dynamic compensating processes, and their uncertainty, is an improvement that complements current survival analysis methods. Removal of organic micropollutants from wastewater by post-ozonation has been investigated in a municipal wastewater treatment plant (WWTP) temporarily upgraded with full-scale ozonation, followed by sand filtration, as an additional treatment step of the secondary effluent. Here, the SPEAR (species at risk) indicator was used to analyse macroinvertebrate abundance data that were collected in the receiving stream before, during and after ozonation to investigate whether ozonation improved the water quality. The SPEAR values indicate a better water quality downstream the WWTP during ozonation. With ozonation the relative abundance of vulnerable macroinvertebrates in the stream receiving the treated wastewater increases from 18 % (CI 15–21 %) to 30 % (CI 28–32 %). This increase of 12 % (CI 8–16 %) indicates improved ecological quality of the stream and shifts classification according to the Water Framework Directive from poor to moderate. Why do some individuals survive after exposure to chemicals while others die? Either, the tolerance threshold is distributed among the individuals in a population, and its exceedance leads to certain death, or all individuals share the same threshold above which death occurs stochastically. The previously published General Unified Threshold model of Survival (GUTS) established a mathematical relationship between the two assumptions. 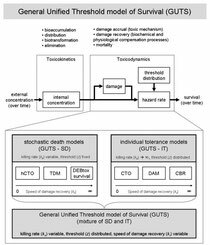 According to this model stochastic death would result in systematically faster compensation and damage repair mechanisms than individual tolerance. Thus, we face a circular conclusion dilemma because inference about the death mechanism is inherently linked to the speed of damage recovery. We provide empirical evidence that the stochastic death model consistently infers much faster toxicodynamic recovery than the individual tolerance model. Survival data can be explained by either, slower damage recovery and a wider individual tolerance distribution, or faster damage recovery paired with a narrow tolerance distribution. The toxicodynamic model parameters exhibited meaningful patterns in chemical space, which is why we suggest toxicodynamic model parameters as novel phenotypic anchors for in vitro to in vivo toxicity extrapolation. GUTS appears to be a promising refinement of traditional survival curve analysis and dose response models. 40. Carter LJ, Ashauer R, Ryan JJ & Boxall ABA (2014): Minimised Bioconcentration Tests: A Useful Tool for Assessing Chemical Uptake into Terrestrial and Aquatic Invertebrates? Environ. Sci. Technol. 48, 13497-13503 (link). Current guidelines for determining bioconcentration factors (BCF) and uptake and depuration rate constants require labor intensive studies with large numbers of organisms. A minimized approach has recently been proposed for fish BCF studies but its applicability to other taxonomic groups is unknown. In this study, we therefore evaluate the use of the minimized approach for estimating BCF and uptake and depuration rate constants for chemicals in aquatic and terrestrial invertebrates. Data from a range of previous BCF studies were resampled to calculate BCFs and rate constants using the minimized method. The resulting values were then compared to values obtained using full study designs. Results demonstrated a good correlation for uptake rate constants, a poor correlation for depuration rate constants and a very good correlation between the BCFs obtained using the traditional and minimized approach for a variety of organic compounds. The minimized approach therefore has merit in deriving bioconcentration factors and uptake rate constants but may not be appropriate for deriving depuration rate constants for use in, for example, toxico-kinetic toxico-dynamic modeling. The approach uses up to 70% fewer organisms, requires less labor and has lower analytical costs. The minimized design therefore could be a valuable approach for running large multifactorial studies to assess bioconcentration of the plethora of chemicals that occur in the environment into the many taxonomic groups that occur in the environment. The approach should therefore help in accelerating the development of our understanding of factors and processes affecting uptake of chemicals into organisms in the environment. 39. Galic N, et al. (2014): Modeling the contribution of toxicokinetic and toxicodynamic processes to the recovery of Gammarus pulex populations after exposure to pesticides. Environ. Toxicol. Chem. 33, 1476-1488 (link). Because aquatic macroinvertebrates may be exposed regularly to pesticides in edge-of-the-field water bodies, an accurate assessment of potential adverse effects and subsequent population recovery is essential. Standard effect risk assessment tools are not able to fully address the complexities arising from multiple exposure patterns, nor can they properly address the population recovery process. In the present study, we developed an individual-based model of the freshwater amphipod Gammarus pulex to evaluate the consequences of exposure to 4 compounds with different modes of action on individual survival and population recovery. Effects on survival were calculated using concentration–effect relationships and the threshold damage model (TDM), which accounts for detailed processes of toxicokinetics and toxicodynamics. 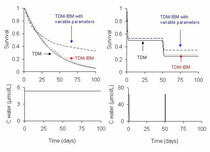 Delayed effects as calculated by the TDM had a significant impact on individual survival and population recovery. We also evaluated the standard assessment of effects after short-term exposures using the 96-h concentration–effect model and the TDM, which was conservative for very short-term exposure. An integration of a TKTD submodel with a population model can be used to explore the ecological relevance of ecotoxicity endpoints in different exposure environments. 38. Kookana, R. S. et al. (2014): Nanopesticides: Guiding Principles for Regulatory Evaluation of Environmental Risks. Journal of Agricultural and Food Chemistry 62, 4227-4240 (link). Nanopesticides or nano plant protection products represent an emerging technological development that, in relation to pesticide use, could offer a range of benefits including increased efficacy, durability, and a reduction in the amounts of active ingredients that need to be used. A number of formulation types have been suggested including emulsions (e.g., nanoemulsions), nanocapsules (e.g., with polymers), and products containing pristine engineered nanoparticles, such as metals, metal oxides, and nanoclays. The increasing interest in the use of nanopesticides raises questions as to how to assess the environmental risk of these materials for regulatory purposes. Here, the current approaches for environmental risk assessment of pesticides are reviewed and the question of whether these approaches are fit for purpose for use on nanopesticides is addressed. Potential adaptations to existing environmental risk assessment tests and procedures for use with nanopesticides are discussed, addressing aspects such as analysis and characterization, environmental fate and exposure assessment, uptake by biota, ecotoxicity, and risk assessment of nanopesticides in aquatic and terrestrial ecosystems. Throughout, the main focus is on assessing whether the presence of the nanoformulation introduces potential differences relative to the conventional active ingredients. The proposed changes in the test methodology, research priorities, and recommendations would facilitate the development of regulatory approaches and a regulatory framework for nanopesticides. 37. Nyman A-M, Schirmer K, Ashauer R (2014): Importance of Toxicokinetics for Interspecies Variation in Sensitivity to Chemicals. Environ. Sci. Technol. 48, 5946-5954 (link). Interspecies variation in sensitivity to synthetic chemicals can be orders of magnitude large. 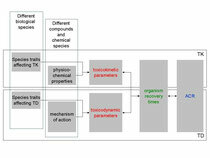 Species traits causing the variation can be related to toxicokinetics (uptake, distribution, biotransformation, elimination) or toxicodynamics (interaction with biological target sites). We present an approach to systematically measure and model the contribution of uptake, biotransformation, internal distribution, and elimination kinetics toward species sensitivity differences. The aim is to express sensitivity as target tissue specific, internal lethal concentrations. A case study with the pesticides diazinon, imidacloprid, and propiconazole and the aquatic invertebrates Gammarus pulex, Gammarus fossarum, and Lymnaea stagnalis illustrates the approach. L. stagnalis accumulates more pesticides than Gammaridae when measured in whole organisms but less in target tissues such as the nervous system. Toxicokinetics, i.e. biotransformation and distribution, explain the higher tolerance of L. stagnalis to the insecticide diazinon when compared to Gammaridae. L. stagnalis was again more tolerant to the other neurotoxicant imidacloprid; however, the difference in sensitivity could not be explained by toxicokinetics alone, indicating the importance of toxicodynamic differences. Sensitivity to propiconazole was comparable among all species and, when expressed as internal lethal concentrations, falls in the range of baseline toxicity. 36. Agatz A, Ashauer R, Brown CD (2014): Imidacloprid perturbs feeding of Gammarus pulex at environmentally relevant concentrations. Environ. Toxicol. Chem. 33, 648-653 (link). Changes in food uptake by detritivorous macroinvertebrates could disrupt the ecosystem service of leaf litter breakdown, necessitating the study of shredding under anthropogenic influences. The impact of the neonicotinoid insecticide imidacloprid on the feeding rate of individual Gammarus pulex was measured at a daily resolution both during and after a 4-d exposure period. The authors found that imidacloprid inhibits feeding of G. pulex during exposure at concentrations ≥30 µg/L and that there was no recovery in feeding on transfer into clean media for 3 d. Exposure to imidacloprid at concentrations ≥0.81 µg/L and ≤9.0 µg/L resulted in increased feeding after exposure even though there was no significant effect on feeding during the exposure itself. Comparison with the literature shows that concentrations found to influence feeding lie within the range of estimated and measured environmental concentrations. Additionally, effects on feeding rate were observed at concentrations 2 orders of magnitude lower than those causing mortality. The lethal concentration for 50% of test organisms after 4 d of exposure (270 µg/L, literature data) and the effect concentration for a reduction in feeding by 50% (5.34 µg/L) were used for this comparison. The present study discusses the potential that effects on feeding may evoke effects at the population level or disturb leaf litter breakdown in the environment. 35. Stadnicka-Michalak J, Tanneberger K, Schirmer K, Ashauer R (2014): Measured and Modeled Toxicokinetics in Cultured Fish Cells and Application to In Vitro - In Vivo Toxicity Extrapolation. PLoS ONE 9, (link, open access). 34. 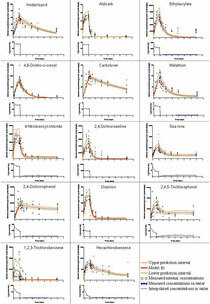 Chiaia-Hernandez AC, Ashauer R, Moest M, Hollingshaus T, Jeon J, Spaak P, Hollender J (2013). Bioconcentration of Organic Contaminants in Daphnia Resting Eggs. Environmental Science & Technology 47, (18), 10667–10675 (link to paper in ES&T journal). Organic contaminants detected in sediments from Lake Greifensee and other compounds falling in the log Dow range from 1 to 7 were selected to study the bioconcentration of organic contaminants in sediments in Daphnia resting eggs (ephippia). Our results show that octocrylene, tonalide, triclocarban, and other personal care products, along with pesticides and biocides can accumulate in ephippia with log BCF values up to 3. 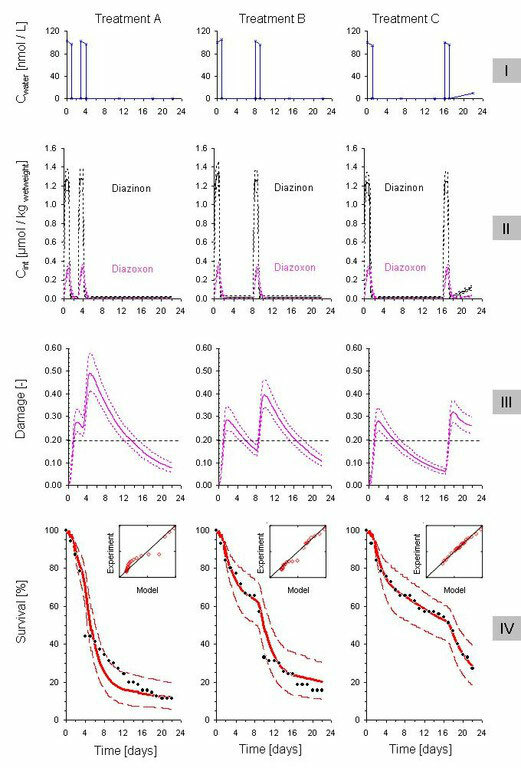 Data on the uptake and depuration kinetics show a better fit toward a two compartment organism model over a single compartment model due to the differences in ephippial egg content in the environment. The obtained BCFs correlate with hydrophobicity for neutral compounds. Independence between BCF and hydrophobicity was observed for partially ionized compounds with log Dow values around 1. Internal concentrations in ephippia in the environment were predicted based on sediment concentrations using the equilibrium partitioning model and calculated BCFs. Estimated internal concentration values ranged between 1 and 68,000 μg/kglip with triclocarban having the highest internal concentrations followed by tonalide and triclosan. The outcomes indicate that contaminants can be taken up by ephippia from the water column or the pore water in the sediment and might influence fitness and sexual reproduction in the aquatic key species of the genus Daphnia. Abstract: Exposure and depuration experiments for Gammarus pulex and Daphnia magna were conducted to quantitatively analyze biotransformation products (BTPs) of organic micropollutants (tramadol, irgarol, and terbutryn). Quantification for BTPs without available standards was performed using an estimation method based on physicochemical properties. Time-series of internal concentrations of micropollutants and BTPs were used to estimate the toxicokinetic rates describing uptake, elimination, and biotransformation processes. Bioaccumulation factors (BAF) for the parents and retention potential factors (RPF), representing the ratio of the internal amount of BTPs to the parent at steady state, were calculated. Nonlinear correlation of excretion rates with hydrophobicity indicates that BTPs with lower hydrophobicity are not always excreted faster than the parent compound. For irgarol, G.pulex showed comparable elimination, but greater uptake and BAF/RPF values than D.magna. Further, G. pulex had a whole set of secondary transformations that D. magna lacked. Tramadol was transformed more and faster than irgarol and there were large differences in toxicokinetic rates for the structurally similar compounds irgarol and terbutryn. Thus, predictability of toxicokinetics across species and compounds needs to consider biotransformation and may be more challenging than previously thought because we found large differences in closely related species and similar chemical structures. 32. Ashauer & Brown (2013). Highly time-variable exposure to chemicals - toward an assessment strategy. Integrated Environmental Assessment and Management (link to paper at IEAM). Many contaminants are released into aquatic systems intermittently in a series of pulses. Pulse timing and magnitude can vary according to usage, compound-specific physicochemical properties, and use area characteristics. Standard laboratory ecotoxicity tests typically employ continuous exposure concentrations over defined durations and thus may not accurately and realistically reflect the effects of certain compounds on aquatic organisms, resulting in potential over- or underestimation. Consequently, the relative effects of pulsed (2 and 4 d) and continuous exposures of the duckweed Lemna minor to isoproturon, metsulfuron-methyl, and pentachlorophenol over a period of 42 d were explored in the present study. At the highest test concentrations, exposure of L. minor to pulses of metsulfuron-methyl resulted in effects on growth similar to those of an equivalent continuous exposure. For isoproturon, pulsed exposures had a lower impact than a corresponding continuous exposure, whereas the effect of pentachlorophenol delivered in pulses was greater. These differences may be explained by compound-specific uptake and degradation or dissipation rates in plants and the recovery potential that occurs following pulses for different pesticides. Given these results, use of a simple time-weighted average approach to estimate effects of intermittent exposures from short-term standard toxicity studies may not provide an accurate prediction that reflects realistic exposure scenarios. Development of mechanistic modeling approaches may facilitate better estimates of effects from intermittent exposures. 28. Kretschmann A., Ashauer R., Hollender J., Escher B.I. (2012). Toxicokinetic and toxicodynamic model for diazinon toxicity—mechanistic explanation of differences in the sensitivity of Daphnia magna and Gammarus pulex. Environmental Toxicology and Chemistry. in press, (available online). A mechanistic toxicokinetic and toxicodynamic model for acute toxic effects (immobilization, mortality) of the organothiophosphate insecticide diazinon in Daphnia magna is presented. The model was parameterized using measured external and internal (whole-body) concentrations of diazinon, its toxic metabolite diazoxon, and the inactive metabolite 2-isopropyl-6-methyl-4-pyrimidinol, plus acetylcholinesterase (AChE) activity measured during exposure to diazinon in vivo. The toxicokinetic and toxicodynamic model provides a coherent picture from exposure to the resulting toxic effect on an organism level through internally formed metabolites and the effect on a molecular scale. A very fast reaction of diazoxon with AChE (pseudo first-order inhibition rate constant ki = 3.3 h−1) compared with a slow formation of diazoxon (activation rate constant kact = 0.014 h−1) was responsible for the high sensitivity of D. magna toward diazinon. Recovery of AChE activity from inhibition was slow and rate-determining (99% recovery within 16 d), compared with a fast elimination of diazinon (99% elimination within 17 h). The obtained model parameters were compared with toxicokinetic and toxicodynamic parameters of Gammarus pulex exposed to diazinon from previous work. This comparison revealed that G. pulex is less sensitive because of a six times faster detoxification of diazinon and diazoxon and an approximately 400 times lower rate for damage accrual. These differences overcompensate the two times faster activation of diazinon to diazoxon in G. pulex compared to D. magna. The present study substantiates theoretical considerations that mechanistically based effect models are helpful to explain sensitivity differences among different aquatic invertebrates. Bioaccumulation and biotransformation are key toxicokinetic processes that modify toxicity of chemicals and sensitivity of organisms. 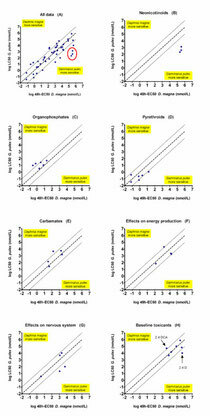 Bioaccumulation kinetics vary greatly among organisms and chemicals; thus, we investigated the influence of biotransformation kinetics on bioaccumulation in a model aquatic invertebrate using fifteen 14C-labeled organic xenobiotics from diverse chemical classes and physicochemical properties (1,2,3-trichlorobenzene, imidacloprid, 4,6-dinitro-o-cresol, ethylacrylate, malathion, chlorpyrifos, aldicarb, carbofuran, carbaryl, 2,4-dichlorophenol, 2,4,5-trichlorophenol, pentachlorophenol, 4-nitrobenzyl-chloride, 2,4-dichloroaniline, and sea-nine (4,5-dichloro-2-octyl-3-isothiazolone)). We detected and identified metabolites using HPLC with UV and radio-detection as well as high resolution mass spectrometry (LTQ-Orbitrap). Kinetics of uptake, biotransformation, and elimination of parent compounds and metabolites were modeled with a first-order one-compartment model. Bioaccumulation factors were calculated for parent compounds and metabolite enrichment factors for metabolites. Out of 19 detected metabolites, we identified seven by standards or accurate mass measurements and two via pathway analysis and analogies to other compounds. 1,2,3-Trichlorobenzene, imidacloprid, and 4,6-dinitro-o-cresol were not biotransformed. Dietary uptake contributed little to overall uptake. Differentiation between parent and metabolites increased accuracy of bioaccumulation parameters compared to total 14C measurements. Biotransformation dominated toxicokinetics and strongly affected internal concentrations of parent compounds and metabolites. Many metabolites reached higher internal concentrations than their parents, characterized by large metabolite enrichment factors. The uptake and depuration of a range of pharmaceuticals in the freshwater shrimp (Gammarus pulex) and the water boatman (Notonecta glauca) was studied. For one compound, studies were also done using the freshwater snail Planobarius corneus. In G. pulex, bioconcentration factors (BCFs) ranged from 4.6 to 185,900 and increased in the order moclobemide < 5-fluoruracil < carbamazepine < diazepam < carvedilol < fluoxetine. In N. glauca BCFs ranged from 0.1 to 1.6 and increased in the order 5-fluorouracil < carbamazepine < moclobemide < diazepam < fluoxetine < carvedilol. For P. corneus, the BCF for carvedilol was 57.3. The differences in degree of uptake across the three organisms may be due to differences in mode of respiration, behaviour and the pH of the test system. BCFs of the pharmaceuticals for each organism were correlated to the pH-corrected liposome–water partition coefficient of the pharmaceuticals. 23. Ashauer R, Wittmer I, Stamm C and Escher BI (2011): Environmental Risk Assessment of Fluctuating Diazinon Concentrations in an Urban and Agricultural Catchment Using Toxicokinetic–Toxicodynamic Modeling. Environmental Science & Technology, 45 (22), 9783-9792. (link at journal) or (download below). Environmental Risk Assessment of Fluctuating Diazinon Concentrations in an Urban and Agricultural Catchment Using Toxicokinetic–Toxicodynamic Modeling. The aim of this study is to apply the Bayesian method of identifying optimal experimental designs to a toxicokinetic–toxicodynamic model that describes the response of aquatic organisms to time dependent concentrations of toxicants. As for experimental designs, we restrict ourselves to pulses and constant concentrations. A design of an experiment is called optimal within this set of designs if it maximizes the expected gain of knowledge about the parameters. Focus is on parameters that are associated with the auxiliary damage variable of the model that can only be inferred indirectly from survival time series data. Gain of knowledge through an experiment is quantified both with the ratio of posterior to prior variances of individual parameters and with the entropy of the posterior distribution relative to the prior on the whole parameter space. The numerical methods developed to calculate expected gain of knowledge are expected to be useful beyond this case study, in particular for multinomially distributed data such as survival time series data. The organothiophosphate diazinon inhibits the target site acetylcholinesterase only after activation to its metabolite diazoxon. Commonly, the toxicity of xenobiotics toward aquatic organisms is expressed as a function of the external concentration and the resulting effect on the individual level after fixed exposure times. This approach does not account for the time dependency of internal processes such as uptake, metabolism, and interaction of the toxicant with the target site. Here, we develop a mechanistic toxicodynamic model for Daphnia magna and diazoxon, which accounts for the inhibition of the internal target site acetylcholinesterase and its link to the observable effect, immobilization, and mortality. The model was parametrized by experiments performed in vitro with the active metabolite diazoxon on enzyme extracts and in vivo with the parent compound diazinon. The mechanism of acetylcholinesterase inhibition was shown to occur irreversibly in two steps via formation of a reversible enzyme-inhibitor complex. The corresponding kinetic parameters revealed a very high sensitivity of acetylcholinesterase from D. magna toward diazoxon, which corresponds well with the high toxicity of diazinon toward this species. Recovery of enzyme activity but no recovery from immobilization was observed after in vivo exposure to diazinon. The toxicodynamic model combining all in vitro and in vivo parameters was successfully applied to describe the time course of immobilization in dependence of acetylcholinesterase activity during exposure to diazinon. The threshold value for enzyme activity below which immobilization set in amounted to 40% of the control activity. Furthermore, the model enabled the prediction of the time-dependent diazoxon concentration directly present at the target site. A toxicokinetic model for Daphnia magna, which simulates the internal concentration of the insecticide diazinon, its detoxification product 2-isopropyl-6-methyl-4-pyrimidinol, and its active metabolite diazoxon, is presented. During in vivo exposure to diazinon with and without inhibition of cytochrome P450 by piperonyl butoxide, the parent compound as well as its metabolites were quantified with high-performance liquid chromatography-tandem mass spectrometry (LC-MS/MS) in extracts of D. magna. 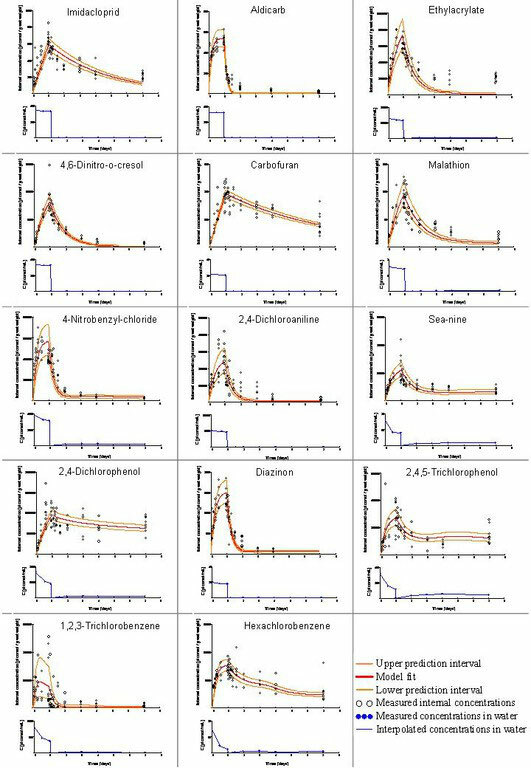 Rate constants of all relevant toxicokinetic steps were obtained by modeling the time course of the internal concentrations with a multicomponent first-order kinetics model. When cytochrome P450 was inhibited, the kinetic bioconcentration factor (BCF) of diazinon increased from 17.8 to 51.0 mL·gww-1. This clearly indicates that diazinon is biotransformed to a high degree by cytochrome P450 in D. magna. The dominant elimination step of diazinon was shown to be its oxidative dearylation to pyrimidinol (62% of total elimination) with a corresponding rate constant of 0.16 h-1. In contrast, oxidative activation to diazoxon with a rate constant of 0.02 h-1 amounted to only 8% of the total elimination. During exposure to diazinon, the active metabolite diazoxon could be detected only in very low concentrations (approximately 0.5% of the parent compound), presumably due to a very fast reaction with the target site acetylcholinesterase. During the exposure experiments (no feeding of daphnids), an exponential decline of the lipid content in D. magna with a first-order rate constant of 0.013 h-1 was observed. For short exposure times (≥24 h), this had only a minor influence on the determined TK parameters. Such a TK model containing detailed biotransformation processes is an important tool for estimation of the toxic potential of chemicals, particularly, when active metabolites are formed inside an organism. We investigated the sensitivity of the freshwater crustacean amphipod Gammarus pulex towards organic xenobiotic compounds in comparison to the sensitivity of the crustacean cladoceran Daphnia magna. In addition we studied the influence of the chemical's mode of action on the relationship between the sensitivity of G. pulex and that of D. magna. We tested the acute toxicity of twelve compounds (Malathion, Aldicarb, Carbofuran, 2,4-dichloroaniline, 2,4-dichlorophenol, 1,2,3-trichlorobenzene, 4,6-dinitro-o-cresol, 2,4,5-trichlorophenol, Ethylacrylate, 4-nitrobenzyl-chloride, Sea-nine, Imidacloprid) with different modes of action and physicochemical properties towards the freshwater amphipod G. pulex in laboratory experiments. Additional toxicity data was collected from the peer-reviewed literature and databases (data pairs for 44 chemicals in total). The chemicals were assigned to seven mode of action groups. The relationship between the sensitivity of G. pulex (48. h-LC50s and 96. h-LC50s) and that of D. magna (48. h-EC50s) was investigated using regression analysis and correlation plots. G. pulex is two to three orders of magnitude more sensitive towards neonicotinoids than D. magna (P= 0.0046, n= 3). For organophosphates we found that D. magna is more sensitive than G. pulex by approximately a factor of six (P= 0.0256, n= 6). There was no significant difference between the sensitivity of D. magna and that of G. pulex in any of the other mode of action groups; however chemicals with the same mode of action grouped together in the same area of the correlation plot. Without the neonicotinoids 75% of all G. pulex toxicity data were within one order of magnitude of the D. magna data and 100% within two orders of magnitude. The regressions with all data and with all data minus neonicotinoids were both significant linear relationships with slopes around one and intercept around zero. Thus, G. pulex is generally equally sensitive towards organic xenobiotics as D. magna. A key challenge in ecotoxicology is to assess the potential risks of chemicals to the wide range of species in the environment on the basis of laboratory toxicity data derived from a limited number of species. These species are then assumed to be suitable surrogates for a wider class of related taxa. For example, Daphnia spp. are used as the indicator species for freshwater aquatic invertebrates. Extrapolation from these datasets to natural communities poses a challenge because the extent to which test species are representative of their various taxonomic groups is often largely unknown, and different taxonomic groups and chemicals are variously represented in the available datasets. Moreover, it has been recognized that physiological and ecological factors can each be powerful determinants of vulnerability to chemical stress, thus differentially influencing toxicant effects at the population and community level. Recently it was proposed that detailed study of species traits might eventually permit better understanding, and thus prediction, of the potential for adverse effects of chemicals to a wider range of organisms than those amenable for study in the laboratory. This line of inquiry stems in part from the ecology literature, in which species traits are being used for improved understanding of how communities are constructed, as well as how communities might respond to, and recover from, disturbance (see other articles in this issue). In the present work, we develop a framework for the application of traits-based assessment. The framework is based on the population vulnerability conceptual model of Van Straalen in which vulnerability is determined by traits that can be grouped into 3 major categories, i.e., external exposure, intrinsic sensitivity, and population sustainability. Within each of these major categories, we evaluate specific traits as well as how they could contribute to the assessment of the potential effects of a toxicant on an organism. We then develop an example considering bioavailability to explore how traits could be used mechanistically to estimate vulnerability. A preliminary inventory of traits for use in ecotoxicology is included; this also identifies the availability of data to quantify those traits, in addition to an indication of the strength of linkage between the trait and the affected process. Finally, we propose a way forward for the further development of traits-based approaches in ecotoxicology. Toxicokinetic-toxicodynamic models (TKTD models) simulate the time-course of processes leading to toxic effects on organisms. Even for an apparently simple endpoint as survival, a large number of very different TKTD approaches exist. These differ in their underlying hypotheses and assumptions, although often the assumptions are not explicitly stated. 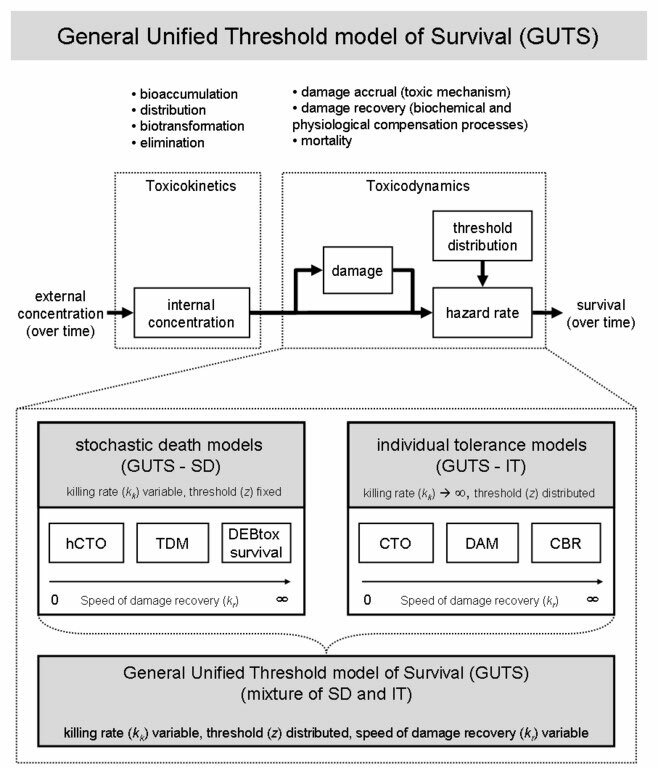 Thus, our first objective was to illuminate the underlying assumptions (individual tolerance or stochastic death, speed of toxicodynamic damage recovery, threshold distribution) of various existing modeling approaches for survival and show how they relate to each other (e.g., critical body residue, critical target occupation, damage assessment, DEBtox survival, threshold damage). Our second objective was to develop a general unified threshold model for survival (GUTS), from which a large range of existing models can be derived as special cases. Specific assumptions to arrive at these special cases are made and explained. Finally, we illustrate how special cases of GUTS can be fitted to survival data. We envision that GUTS will help increase the application of TKTD models in ecotoxicological research as well as environmental risk assessment of chemicals. It unifies a wide range of previously unrelated approaches, clarifies their underlying assumptions, and facilitates further improvement in the modeling of survival under chemical stress. Toxicokinetic-toxicodynamic (TK-TD) models simulate the processes that lead to toxicity at the level of organisms over time. These dynamic simulation models quantify toxicity, but more importantly they also provide a conceptual framework to better understand the causes for variability in different species' sensitivity to the same compound as well as causes for different toxicity of different compounds to the same species. 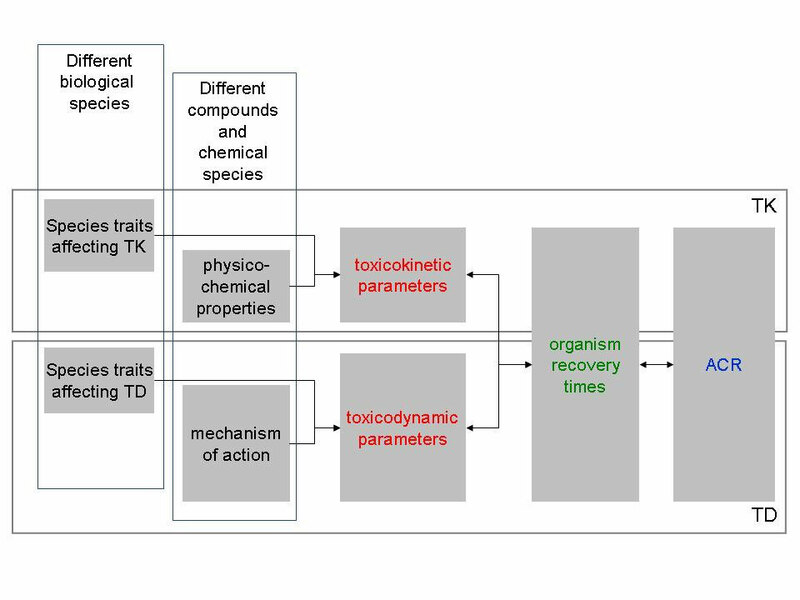 Thus TK-TD models bring advantages for very diverse ecotoxicological questions as they can address two major challenges: the large number of species that are potentially affected and the large number of chemicals of concern. The first important benefit of TK-TD models is the role that they can play to formalize established knowledge about toxicity of compounds, sensitivity of organisms, organism recovery times and carry-over toxicity. The second important aspect of TK-TD models is their ability to simulate temporal aspects of toxicity which makes them excellent extrapolation tools for risk assessment of fluctuating or pulsed exposures to pollutants. We provide a general introduction to the concept of TK-TD modelling for environmental scientists and discuss opportunities as well as current limitations. This article reviews the mechanistic basis of the tissue residue approach for toxicity assessment (TRA). The tissue residue approach implies that whole-body or organ concentrations (residues) are a better dose metric for describing toxicity to aquatic organisms than is the aqueous concentration typically used in the external medium. Although the benefit of internal concentrations as dose metrics in ecotoxicology has long been recognized, the application of the tissue residue approach remains limited. The main factor responsible for this is the difficulty of measuring internal concentrations. We propose that environmental toxicology can advance if mechanistic considerations are implemented and toxicokinetics and toxicodynamics are explicitly addressed. The variability in ecotoxicological outcomes and species sensitivity is due in part to differences in toxicokinetics, which consist of several processes, including absorption, distribution, metabolism, and excretion (ADME), that influence internal concentrations. Using internal concentrations or tissue residues as the dose metric substantially reduces the variability in toxicity metrics among species and individuals exposed under varying conditions. Total internal concentrations are useful as dose metrics only if they represent a surrogate of the biologically effective dose, the concentration or dose at the target site. If there is no direct proportionality, we advise the implementation of comprehensive toxicokinetic models that include deriving the target dose. Depending on the mechanism of toxicity, the concentration at the target site may or may not be a sufficient descriptor of toxicity. The steady-state concentration of a baseline toxicant associated with the biological membrane is a good descriptor of the toxicodynamics of baseline toxicity. When assessing specific-acting and reactive mechanisms, additional parameters (e.g., reaction rate with the target site and regeneration of the target site) are needed for characterization. For specifically acting compounds, intrinsic potency depends on 1) affinity for, and 2) type of interaction with, a receptor or a target enzyme. These 2 parameters determine the selectivity for the toxic mechanism and the sensitivity, respectively. Implementation of mechanistic information in toxicokinetic-toxicodynamic (TK-TD) models may help explain timedelayed effects, toxicity after pulsed or fluctuating exposure, carryover toxicity after sequential pulses, and mixture toxicity.We believe that this mechanistic understanding of tissue residue toxicity will lead to improved environmental risk assessment. Recent advances in modeling the processes of the toxicity of chemicals-toxicokinetics (TK) and toxicodynamics (TD)-are improving environmental risk assessment (ERA) through prediction of effects from time-varying exposure. This has been achieved by linking chemical fate and toxicological effects mechanistically, based on internal concentrations, through the tissue residue approach. However, certain questions remain: for example, how do TK and TD differ among species and how does this relate to differences in species sensitivity? In a series of experiments, we studied the TK of [14C]chlorpyrifos in 15 freshwater arthropod species, two of which were studied in juvenile and adult life stages. Uptake (kin) and elimination (kout) rate constants were fitted using a one-compartment single first-order kinetic model. The application of two complementary parameter estimation methods facilitated the calculation of bioconcentration factors (BCF) with prediction intervals and 95% depuration times (t95) for all tested species. Extremely slow elimination was observed in some species as well as high overall variation in kin, kout, BCF, and t95 across the tested aquatic arthropod species. This variation has implications for the development of TKTD approaches in ERA, including assessing fluctuating exposure concentrations and the interpretation of observed toxicity responses in the laboratory and in the field. Uptake and elimination rate constants, bioaccumulation factors, and elimination times in the freshwater arthropod Gammarus pulex were measured for 14 organic micropollutants covering a wide range of hydrophobicity (imidacloprid, aldicarb, ethylacrylate, 4,6-dinitro-o-cresol, carbofuran, malathion, 4-nitrobenzyl-chloride, 2,4-dichloroaniline, Sea-Nine, 2,4-dichlorophenol, diazinon, 2,4,5-trichlorophenol, 1,2,3-trichlorobenzene, and hexachlorobenzene; all 14C-labeled). The toxicokinetic parameters were determined by least-square fitting of a one-compartment first-order toxicokinetic model, followed by Markov Chain Monte Carlo parameter estimation. The parameter estimation methods used here account for decreasing aqueous concentrations during the exposure phase or increasing aqueous concentrations during the elimination phase of bioaccumulation experiments. It is not necessary to keep exposure concentrations constant or zero during uptake and elimination, respectively. Neither is it required to achieve steady state during the exposure phase; hence, tests can be shorter. Prediction intervals, which take the between-parameter correlation into account, were calculated for bioaccumulation factors and simulations of internal concentrations under variable exposure. The lipid content of Gammarus pulex was 1.3% of wet weight, consisting of 25% phospholipids and 75% triglycerides. Size-dependent bioaccumulation was observed for eight compounds, although the magnitudes of the relationships were too small to be of practical relevance. Elimination times ranged from 0.45 to 20 d, and bioaccumulation factors ranged from 1.7 to 4,449 L/kg. The identified compounds with unexpectedly long elimination times should be given priority in future studies investigating the biotransformation of these compounds. Carry-over toxicity occurs when organisms exposed to an environmental toxicant survive but carry some damage resulting in reduced fitness. Upon subsequently encountering another exposure event stronger effects are possible if the organisms have not yet fully recovered. Carry-over toxicity was observed after exposure of the freshwater amphipod Gammarus pulex to repeated pulses of diazinon with varying intervals. Uptake, biotransformation and depuration kinetics were determined. Metabolites were identified and quantified (diazoxon, 2-isopropyl-6-methyl-4-pyrimidinol, one nonidentified metabolite). Parameters of a process-based toxicokinetic-toxicodynamic model were determined by least-squares fitting followed by Markov Chain Monte Carlo parameter estimation. Model parametrization was based on the time-course of measured internal concentrations of diazinon and its metabolite diazoxon in combination with the pulsed toxicity experiment. Prediction intervals, which take the covariation between parameters into account, were calculated for bioaccumulation factors, organism recovery time and simulations of internal concentrations as well as the time-course of survival under variable exposure. Organism recovery time was 28 days (95% prediction interval 25−31 days), indicating the possibility for carry-over toxicity from exposure events several weeks apart. The slow organism recovery and carry-over toxicity was caused by slow toxicodynamic recovery; toxicokinetic processes alone would have resulted in a recovery time of only 1−2 days. Toxicokinetic–toxicodynamic (TKTD) models simulate the time-course of toxicant concentration in the organism and toxicity at the level of the organism. A link between TKTD models that simulate survival and individual based models for populations (IBMs) is proposed which allows TKTD parameters to vary between individuals. The TKTD-IBM predicts different survival in response to toxicants when TKTD parameters vary amongst individuals compared to the survival predicted with fixed TKTD parameters. The model with fixed parameters represents the concept of stochastic death whereas the model with variable parameters behaves, at least partly, according to the individual tolerance distribution concept. The whole set of TKTD parameters of an individual can be interpreted as constituting “individual tolerance”. Antibiotics may be released to soils during the application of manure as fertiliser to land. The compounds may subsequently be transported to and contaminate groundwater and surface waters. This paper describes a series of lysimeter-based studies to explore the leaching behaviour of three veterinary antibiotics (sulfachloropyridazine, oxytetracycline and tylosin) under different conditions that could occur in the agricultural environment. The specific objectives were to: (1) explore the influence of slurry amendment and incorporation on leaching; (2) assess the effects of climate on leaching behaviour; and (3) evaluate the predictive capability of a leaching model used in the regulatory assessment of veterinary medicines. Sulfachloropyridazine was detected sporadically in leachate at concentrations up to 0.66 μg L−1 under typical irrigation conditions and more frequently at concentrations up to 8.5 μg L−1 under extreme irrigation conditions. Incorporation and timing of rainfall had no effect on leaching behaviour. Oxytetracycline and tylosin were not detected in any leachate samples. 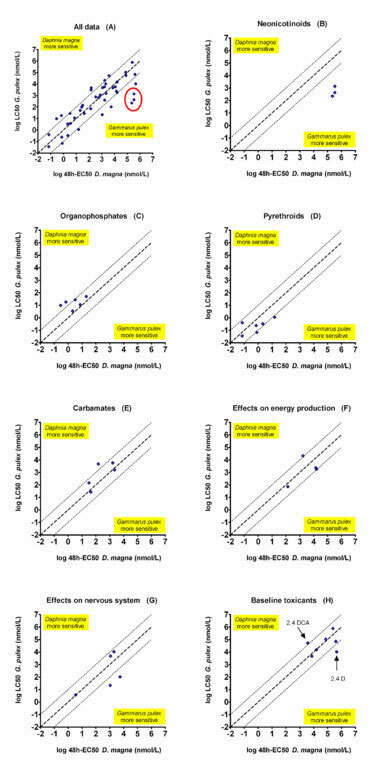 These differences in behaviour were explained by the sorption and persistence characteristics of the compounds. Comparison of the experimental measurements with simulations from the leaching model indicated that the model greatly underestimates the transport of antibiotics to groundwater which raises questions over the application of these models in the regulatory risk assessment process. Existing toxicokinetic and toxicodynamic models and dynamic formulations of popular ecotoxicological concepts (e.g., the critical body residue concept) are examined. Their underlying assumptions about speed of recovery and thresholds are clarified, and a rigorous mathematical treatment shows that they can all be placed within a unifying framework. Such analysis aids in the selection of appropriate ecotoxicological models. Aquatic risk assessment can be improved if we are able to quantitatively predict the effects resulting from sequential pulsed exposure to multiple compounds. We evaluate two modeling approaches, both extended to suit multiple compounds, the semi-mechanistic threshold damage model (TDM), and a model based on time-weighted averages (TWA). The TDM predicts that recovery of damage to Gammarus pulex from exposure to chlorpyrifos takes longer than that from exposure to carbaryl and consequently that the sequence of exposure matters. We measured survival of the freshwater invertebrate Gammarus pulex after sequential pulsed exposure to carbaryl and chlorpyrifos. Two groups of organisms were exposed to a first pulse of either carbaryl or chlorpyrifos for 1 day and then, after a recovery period of two weeks, to a second pulse with the other compound. The comparison of mortalities caused by each pulse, as well as combined mortalities in both treatments, show that the sequence of exposure to pulses of contaminants does indeed matter. Previous exposure to chlorpyrifos leads to significantly increased mortality from subsequent pulses of carbaryl, but not the other way round.The TDM facilitates a process-based ecotoxicological explanation by simulating the recovery dynamics and outperforms the TWA model. Aquatic nontarget organisms are typically exposed to sequential pulses of contaminants with fluctuating concentrations. We use the semimechanistic threshold damage model (TDM) to simulate survival of the aquatic invertebrate Gammarus pulex after sequential pulsed exposure to carbaryl and compare it to a simpler model based on time-weighted averages (TWA). The TDM is a process-based model and we demonstrate how to parametrize it with data from an uptake and elimination experiment together with data from a survival experiment with sequential pulses. The performance of the two models is compared by the fit to the first survival experiment and the simulation of another, independent survival experiment with different exposure patterns. Measured internal concentrations in the first survival experiment are used to evaluate the toxicokinetic submodel of the TDM. 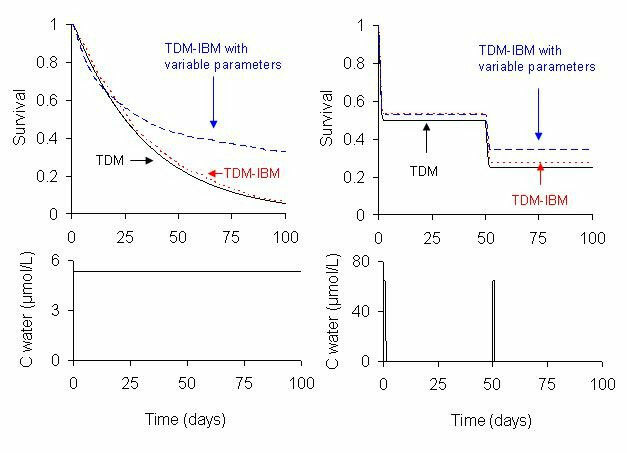 The TDM outperforms the TWA model, facilitates understanding of the underlying ecotoxicological processes, permits calculation of recovery times (3, 15, and 25 days for pentachlorophenol, carbaryl and chlorpyrifos respectively) and enables us to predict the effects of long-term exposure patterns with sequential pulses or fluctuating concentrations. We compare the parameters of the TDM for carbaryl, pentachlorophenol and chlorpyrifos and discuss implications for ecotoxicology and risk assessment. Aquatic nontarget organisms are exposed to fluctuating concentrations or sequential pulses of contaminants, so we need to predict effects resulting from such patterns of exposure. 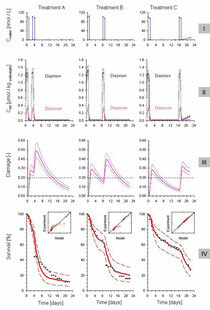 We present a process-based model, the Threshold Damage Model (TDM), that links exposure with effects and demonstrate how to simulate the survival of the aquatic invertebrate Gammarus pulex, Based on survival experiments of up to 28 days duration with three patterns of repeated exposure pulses and fluctuating concentrations of two pesticides with contrasting modes of action (pentachlorophenol and chlorpyrifos) we evaluate the new model and compare it to two approaches based on time-weighted averages. Two models, the Threshold Damage Model and the time-weighted averages fitted to pulses, are able to simulate the observed survival (mean errors 15% or less, r2 between 0.77 and 0.96). The models are discussed with respect to their theoretical base, data needs, and potential for extrapolation to different scenarios. The Threshold Damage Model is particularly useful because its parameters can be used to calculate recovery times, toxicokinetics are separated from toxicodynamics, and parameter values reflect the mode of action. Exposure of aquatic nontarget organisms to pesticides almost always occurs as pulses or fluctuating concentrations. Extrapolation from laboratory to field thus depends on an understanding and ability to simulate effects resulting from these types of exposure. This paper reviews models that may be used to predict effects on aquatic organisms resulting from time-varying exposure to pesticides. We evaluate and compare the theoretical basis of these models and their applicability to the simulation of effects from fluctuating exposures. The many different models rest on only a few basic concepts with differing degrees of mechanistic character. Building on this critical review, we select the most appropriate models and propose modifications. Two process-based models, the threshold hazard model and the modified damage assessment model, represent the optimum descriptions that are available at present. They could facilitate a better understanding of the ecotoxicity of different compound and species combinations and even mixtures of noninteracting compounds. The possibility to model lethal and sublethal effects allows applications in risk assessment, standard setting, and ecological modeling.